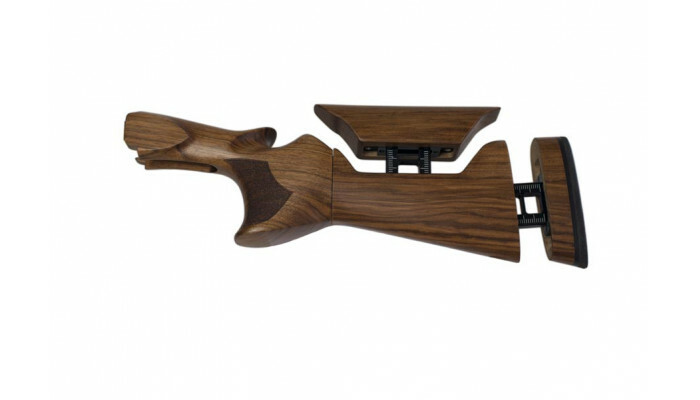 Manufactured from only one wooden blanks of walnut, specifically chosen so that its horizontal grains respect lines of force generated by the gunshots, the Woody Stock presents an exceptional stability, particularly between the 1st and the 2eme gunshot, the barrel does not bound. 4 components wood constituting the Woody Stock come out from the same blanks and thus present a harmonious material density on all the length stock, the gunshot is so more fluid, comfortable and without arm blow. The Woody Stock, thanks to his anatomical handle and to his performing regulation system 5 in 1, allows to avoid, during the execution of the shooting movements, the inconvenient of the importune sliding stock phenomenac, previous the hand on the handle or afterwards the heel on the shoulder, by locking the rifle-shooter structure in an ideal position. To decrease significantly the inconvenience bound to the backward rifle movement, the ergonomic shape of 4 components wood of Woody Stock as well as the positioning in relation to the others, were particularly studied, nothing is no mere coincidence. Thereon and as an example, the in-depth shape of the barrel, also slightly oversized compared with the underlying body stock, cancels almost completely the unpleasant effect of bounce which is passed on to the barrel towards the cheek, often responsible for the harmful phenomenon of unsticking of the cheek between the first one and the second gunshot. The new system of regulation WOODY, patentee, allows to adjust the barrel or the heel in 5 position compared with the body stock. it has to be noted that all these various adjustments is obtained thanks to one and the same system and not by the superposition of several mechanisms. All the regulations are made in a reduced space of 10 cm². Adjustment 2 : rotation of the barrel or the heel. 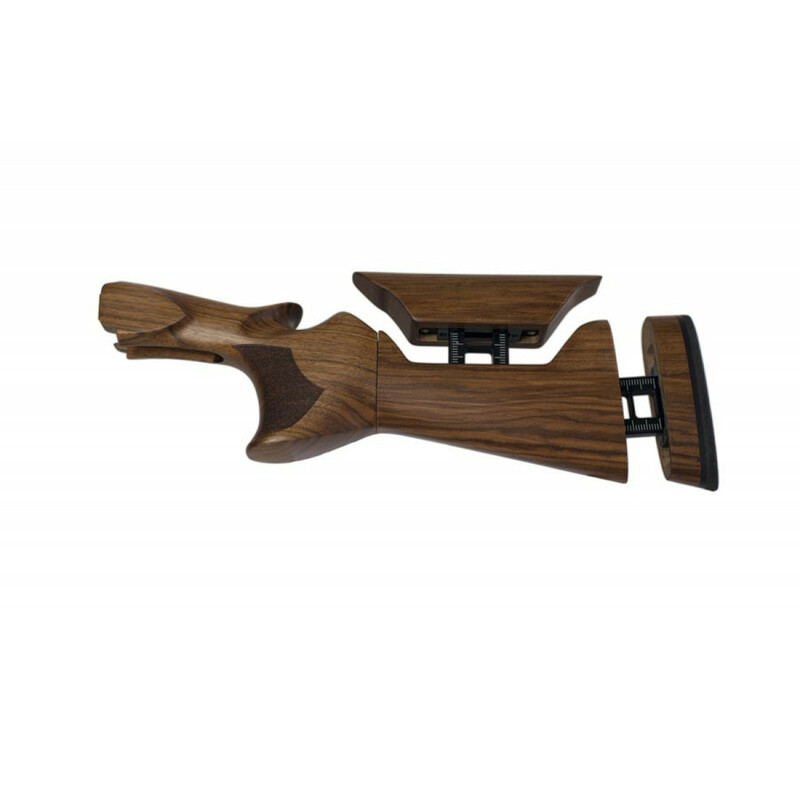 The Woody Stock is the only one to allow a adjustment front and rear of the barrel, the particularly interesting solution is within the adjustment framework of the antero-posterio position of the cheek of the shooters presenting morphologically a long neck or or vice versa a short neck. The important amplitude of the adjustment in height of the barrel, 3cm, allows to pull, with the same barrel, as well at a rifle to flat band as at a rifle to high band. The mode of adjustment of the pitch of the heel is real and very accurate because it corresponds to the orientation of the heel with regard to the perpendicular in the horizontal axis of the rifle, in a reference point given and defined by the choice of the adjustment in 4 other senses of the space. The form of the barrel, much deeper, made so that it is all the surface of the cheek which is naturally in touch with the stock which can benefit effectively from brought adjustments. This advantage is fundamental because besides the fact that it brings a comfort of unequalled and verifiable shooting as of the first gunshot, he allows especially to avoid the conflicts between the wood of the low part of the stock and the low part of the cheek which is often responsible for purely mechanical errors of alignment (Swing to the left with sliding of the heel towards the outside for the right-handers or the swing to the right with sliding of the heel towards the outside for the left-handed persons). The cheek of the shooter put so without constraint in the ideal position of alignment will naturally tend to stay in touch with the stock and will allow a rapid-firing, supple and necessarily effective. – The system 5 in 1 WOODY, allows to avoid the superposition of layers at the level of the heel. It results from it the obtaining of a contact area reduced heel-shoulder which allows to integrate in a more anatomical way the heel into the shoulder. Pro specifické velikost, jako XS nebo XL nás neváhejte kontaktovat.